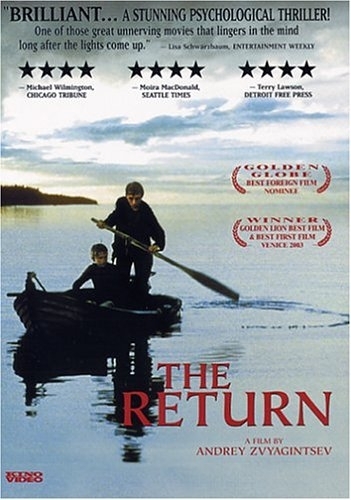 The lives of two teenage brothers, who live with their mother in a desolate village in Russia, are turned upside down when their father returns home after a twelve-year absence. They only have vague memories of him, so vague that they suspect he is an impostor. Nevertheless, the day after his arrival, the father decides to take his children on a fishing trip . The man’s harsh ways lead the eldest son to recognize his authority and submits to it gladly. The younger son, on the other hand, rebels even if he is forced to obey. When the three arrive on an island, lost in the middle of a huge lake, the boys finally try to catch fish while their father recovers a sealed treasure chest from the ground and hides it, unopened, in their boat. But tragedy is laying in wait: the eldest son is severely punished by his father, just for lingering a while, who even threatens him with an axe. Then the youngest son, shocked by his father’s actions, runs away into the forest and hides on top of an iron tower, saving his brother from his father’s violence. The vision of the film is to provide two levels of interpretation. On the one hand, it is a deliberately slow, grim road-movie where mystery is uppermost and the impossible relationship between the father and his sons turns into a sort of fight for survival and self-assertion. On the other hand, the director, who is a newcomer on the big screen after a brilliant career in television, is intent on portraying a mythological transfiguration of the story. Despite rhetorical simplifications, which can be attributed to a kind of naivety of a first film attempt (for example, the depiction of the father in the same identical pose as Mantegna’s “Dead Christ” during the dinner where the father breaks the bread and pours wine and the same division into days which necessarily refers to the Holy Week) the religious and mystical inspiration of the representation is a powerful paradigm of human and family affairs. Zvyagintsev inserts dark events in a wild, beautiful landscape, photographing with the livid and spectral colours of the northern sunrises. He especially and perfectly measures the tones of the tragedy, without however indulging in Aeschylean pompousness, and at the same time he never forgets the magnitude of the themes of the film. Many of the questions posed in the film remain unanswered: who really is the father of the children? And where does he come from? What are his real intentions? What is hidden in the treasure chest? The waters of the huge lake which surround the island hide the secret, placing a headstone on our rational thirst for knowledge. Something has come back from an obscure and faraway world, and it is gone forever in a few days: that moment is a real existential turning point which obliges the two boys to leave childhood games behind and to choose their own place in the world. It is rare to find this ancestral fracture represented in such a ghostly and chilling beauty. The film was rightly awarded a fully deserved Golden Lion.